Here it is part 2 of my reflections on the ministry document “Better Beginnings, Better Futures”. A big part of this document discusses the importance of being willing to work with partners to ensure the success of the students in your preKindergarten program. Some of the many partners suggested are parents,wider family members, support staff, district staff, community groups, and community support agencies. It really does take a village to raise a child and to provide a quality preKindergarten program. Many times teachers tend to operate in isolation and this is due in part to the nature of the job. However, it’s important to never think of ourselves as alone in the work we do. We need to invite families into our classrooms, and provide them with resources to support learning in their homes. Our students need us to be the bridge between their school and home lives. This is a powerful connection that we can make that will greatly benefit our students and their achievement. Parents and family supports can also be amazing way to lower student/adult ratios to provide more small group learning experiences. A few parent volunteers can be worth their weight in gold and should be treated well. I noticed in my internship that many families want to be involved and are just wanting to know how. Clear communication can greatly enhance your relationship with parents and can be as simple as greeting them when they bring their children to school or as formal as newsletters. I plan on using some of both in my classroom because I want parents to feel like they are an important part of the classroom. Another important partnership we can make is to be willing to make use of our support staff and professionals that operate within our school and school division. During my internship we had students who had needs that went far beyond what I or my co-op felt able to confidently meet. The student support teams were invaluable to helping us to devise plans and ideas to meet these students needs. Without these supports we truly would have been alone and there is only so much a teacher can do on their own. The wider community supports is an area that I think a lot of teachers forget about, however, there are many professionals and organizations that will partner with teachers. In some cases these partnerships can be just a simple visit to the classroom such as inviting the health nurse in to share about germ prevention or an elder to share traditional teachings. In some cases you might need help to provide nutritional food for snacks so your local grocer or other businesses can help fund or supply food. There are many partners in our classrooms and the main thing we need to remember as teachers is to keep inviting and searching out partners so we can better meet our students needs. Posted in Uncategorized and tagged Early Childhood, ECE, parents, partners in education, PreKindergarten. Bookmark the permalink. I will write a few posts about my internship experience a little later but first I have some reflections to write for my Early Childhood Education class. We are examining the PreKindergarten standards book “Better Beginnings, Better Futures” by the Ministry of Education. It’s hard to write a meaningful reflection when you agree so wholeheartedly with a document. We were only supposed to read half of it for this first reflection but I’ll admit I read the whole thing just because it was an easy and engaging read. Many of the ideas put forth in this publication are not groundbreaking or difficult to implement. They are however well grounded in solid pedagogical research and written up in an accessible way. It is very insightful of the ministry to provide teachers with such a useful and forward thinking guide book to planning a prekindergarten program. I have a particular interest in preKindergarten and part of the reason I am at the University of Regina is because they offer an Early Childhood Education degree option. Knowing that I may not be working in a setting where a formal preKindergarten program exists or where their may not be clear guidelines makes this document invaluable to me. It gives me something I can put in my professional toolbox that can guide me in establishing a preKindergarten program even if I am in a context without outside supports. I also appreciated that there was such a complete bibliography which will help me further my research and professional development. Having a reading list to keep developing my pedagogy will be important once I am out in the field and away from the academic setting of the university. I know from my internship that time is at a premium while teaching it is still important to keep up with some professional reading and development. Part of being a good teacher is being a reflective teacher that can read new ideas and look for ways to improve my practice. Also knowing where to go for deeper understandings of the reasons behind proven pedagogical practices and to help me refine and perfect those practices. Posted in Uncategorized and tagged Early Childhood, ECE, PreKindergarten. Bookmark the permalink. I was excited to hear that Reading Rainbow was developing an IPad app but nervous to see if it could meet my expectations. I downloaded the app because it’s free and began checking it out. It is truly excellent and I am really pleased with it. However, you should note that to get access to all the books will cost you 9.99/month but that would be well worth it. As a parent you get access to a website that tracks your child’s reading time and number of books, there is also a section with tips and ideas to enhance the time you spend reading with your child. The app has different topic islands that the child can visit. Each island has at least fifty books right now with the promise of more. As well there are videos showing real life content that ties into those topics hosted by Levar Burton. Each book has the option of being read to the child by a narrator, or to read themselves. There is also fun surprises hidden on the pages to touch and animate the illustrations. In addition most books include a game like matching. For teachers, they are developing a website section that should launch by fall but the app itself is a great tool. I can see using it within guided reading groups as a fun listen to books option. This truly is one of the best educational apps I’ve checked out and if they keep developing content the way they promise it will just get better. Posted in Book List and tagged books, iPad apps, literacy, reading rainbow, technology. Bookmark the permalink. parents. So I’ve packed a box with my planing resources and will get started on some unit plans. I’m glad to have some units to plan because it helps my feel more prepared for the fall and gives me an outlet for my excitement and nerves. I’m lucky in that my mom is also a teacher although she specializes in jr/sr high. She actually now has her masters and works as a vice principal of a junior high. She is an excellent person for me to bounce my ideas off of and has great advice for me. She is also working hard on her timetable for her school. Time tabling is a major job I’ve learned and something most teachers don’t have to deal with but I’ve appreciated the glimpse into how schools are organized. Well back to the novel I’m enjoying as I relax for another couple of days, I figure I worked hard all semester so a little down time is deserved. Posted in Uncategorized and tagged planning, Relaxation, time tabling. Bookmark the permalink. Posted in Tech Tasks. Bookmark the permalink. 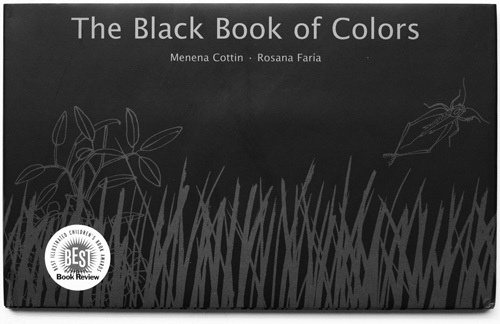 I based my paper around a great children’s book “The Black Book of Colors” by Menena Cottin & Rosana Farin. Even if you don’t read my paper this book is worth checking out. It describes the colours the way a blind child experiences them. The illustrations are black on black so they can best be felt rather than seen. It is a feast for the tactile sense and the poetic words provide a brief insight into the way people without sight perceive the world around them. Posted in Book List, Inclusive Education and tagged black book of colours, blindness, inclusive education. Bookmark the permalink. Okay it’s the last week of semester and yep I’ve been MIA off my blog for the last few days. I apologize but it seems no matter how well I try to plan ahead the last week before the end of classes is really busy. I’ve been writing papers and finalizing projects for what feels like 30 classes (but it’s actually only 3 they tell me). As well I’ve been longing for my family in Alberta it’s been a long time since I’ve seen my cute nephew. Tonight I have the first of my projects to share, a complete 40 item booklist of great classroom reads. Booklist just click this link and you should be able to access the pdf version of my list. Some of these books I’ve featured already on my weekly lists but there are a more great picks here for you. Since summer is a great time to search for booksales and do some reading I thought I’d add a few titles to your lists. Coming up a post on what I’ve learned in my educational computers class (hopefully a fun interactive slideshow), a summary of learning and the final post in my inclusive education series 🙂 whew a busy week! Posted in Book List and tagged blogging, Book list, technology, vacation. Bookmark the permalink.